Such contradictions were not unusual during the scientific revolution. Isaac Newton, who lived in a later time than Kepler (1643 to 1727) did not work in the way a modern scientist would. Also a Protestant with unorthodox views, Newton spent more time investigating the true meaning of the Bible’s words and on the pseudoscience of alchemy than he did on mathematics or physics! Johannes Kepler was born on December 27, 1571, in the town of Weil der Stadt, which then lay in the Holy Roman Empire, and is now in Germany. His mother, Katharina Guldenmann, was a herbalist who helped run an inn owned by her father. When Johannes was about five years old, his father, Heinrich Kepler, was killed in Holland fighting as a mercenary. The young Johannes Kepler was prone to ill-health. His hands were crippled and his eyesight permanently impaired by smallpox. Despite these difficulties, guests at his grandfathers’ inn were astonished at his ability to solve any problem they brought him involving numbers. His herbalist mother, Katharina, tried to convey her love of the natural world to her son. She made a point of taking him out at night to show him interesting things in the heavens, including a comet and a lunar eclipse. In doing so, she set her son on a course which would eventually transform our understanding of the solar system and the universe. Johannes Kepler was inspired by the sight of the moon turning red during a lunar eclipse. His mother took him outside to see the eclipse when he was nine years old. He remembered this event clearly for the rest of his life. Image by Brian Paczkowski. Kepler was formally schooled in Latin – the language of academics, the legal profession and churchmen throughout Europe – and then attended the Protestant Seminary of Maulbronn, because he wished to become a Protestant minister. Completing his studies at Maulbronn, he moved on to the University of Tübingen. There, although he took courses in Theology, Greek, Hebrew, and Philosophy, it was in Mathematics that he stood out. He was one of the few students deemed intellectually and mathematically capable of being taught the work of Nicolaus Copernicus. Kepler decided that Copernicus’s heliocentric hypothesis, that the sun lay at the center of the solar system, was correct. In 1594, aged 23, Kepler became a lecturer in astronomy and mathematics at the Protestant School in the city of Graz, Austria. 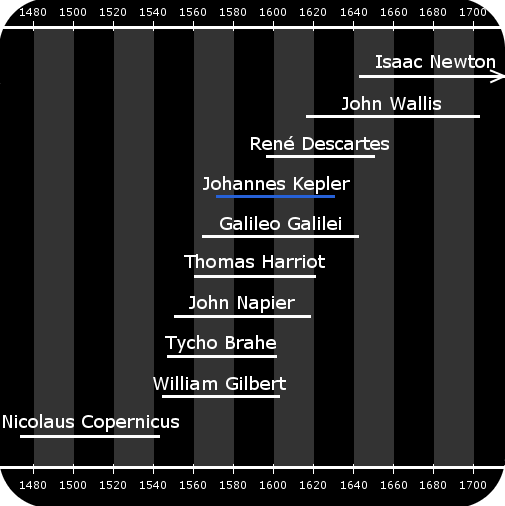 Kepler’s lifetime and the lifetimes of related scientists and mathematicians. Kepler thought Copernicus’s heliocentric view of the solar system was right. His own belief was that the sun exerted a force on the planets orbiting it. In 1596, at the age of 25, he published a book – Mystery of the Cosmos. His book explained why, logically, the sun lay at the center of the solar system. Kepler noted that Mercury and Venus always seem to be close to the sun, unlike Mars, Jupiter and Saturn. This is because Mercury and Venus’s orbits are closer to the sun than Earth’s. Kepler said that if the sun and all the planets orbited Earth, there is no reason why Mercury and Venus should always be near the sun. Looking for evidence of ‘God the mathematician,’ Kepler was able to justify six planets and their distances from the sun in terms of the five Platonic solids. These are the five highly symmetrical, regular, 3D solids whose perfect symmetry allows them to be used as dice. The Platonic Solids – Kepler believed these shapes determine how far each of the six known planets lay from the sun. Remarkably, looked at in the way Kepler did, his Platonic solids theory produced a close fit to the planet-to-sun distances that Copernicus had found. Kepler believed the solar system’s planets orbited the sun in circular paths whose sizes were determined by an arrangement of the five Platonic Solids. Thrilled that he had found evidence of the hand of God in the solar system’s design, Kepler now sought better data. He hoped that more accurate astronomical observations would prove his theory. 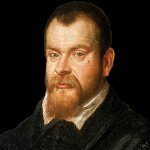 By great good fortune, at exactly the same time as Kepler sought better data, one of Europe’s foremost astronomers, Tycho Brahe, was hoping to recruit an assistant who could carry out astronomy calculations. The two started working together, although it was not a match made in heaven! Tycho was notoriously quarrelsome – he had worn a metal nose ever since he lost his real nose in a duel fought over the merits of a particular mathematics formula! Early in the year 1600, Kepler moved from Graz to the town of Benatek, which today is in the Czech Republic. There Tycho, who was the imperial mathematician to Holy Roman Emperor Rudolph II, had an observatory. Tycho gave Kepler access to some of his Mars observations, but not all. Then the pair fell out and Kepler spent some time in Prague, then Graz, before they resolved their differences and got together again. During 1601, Kepler carried out calculations of planet movements for Tycho. In October 1601, Tycho died. Kepler replaced him as the imperial mathematician. Kepler now had unrestricted access to all of Tycho’s astronomical data. With an incredible amount of hard work he began to deduce the laws that govern the movements of the planets. The first law he found is now called his second law! Kepler’s Second Law: a planet orbiting the sun sweeps out equal areas in equal times. In this image, the planet takes the same time to move from A to B as it does to move from C to D. The green and blue shaded areas are equal. The planet speeds up when it is closer to the sun. From Tycho’s very accurate observations, Kepler discovered that Mars does not move in a perfect circle around the sun. This was scandalous! Everyone ‘knew’ that heavenly bodies were perfect, traveling along a path whose shape was perfect – the circle. It took a long time before people came to terms with Kepler’s shocking discovery and started to believe it. All the more so because the planets’ orbits are actually very close to circular. It is a tribute to both the precision of Tycho’s observations and Kepler’s calculating prowess that Kepler was ever able to discover the truth. Kepler found Mars was moving in an oval-like orbit and that sometimes it was closer to the sun than at others. When close to the sun, it moved faster than when it was farther away. 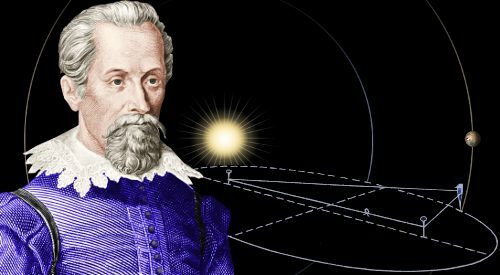 In 1602, Kepler deduced what came to be called his second law: a line drawn from planet to sun sweeps out equal areas in equal times. Kepler tried to figure out the mathematical shape of Mars’s orbit. After about 40 misses, in 1605, he got it right. Mars follows an elliptical path around the sun. And now he formulated what would become Kepler’s first law: planets orbit the sun in ellipses, with the sun at one focus. You can draw an ellipse using pencil, paper, string and pushpins. The closer the pins are together, the closer your ellipse will be to circular. If points A and B coincide, you will draw a circle. A and B are the ellipse’s focuses. Kepler never gave up his idea that regular polygons determine the orbits of the planets. As a fortunate result of this wrong thinking, he continued calculating and theorizing. The square of the period of any planet is proportional to the cube of the semimajor axis of its orbit. Restated crudely, this law means that if we square the time it takes a planet to complete one orbit around the sun, we’ll find it’s proportional to the planet’s distance from the sun cubed. Even more crudely: the farther a planet is from the sun, the slower it moves along its orbital path. In a 17 year period, when he was aged between 30 and 47, Kepler took Copernicus’s mathematically flawed heliocentric solar system by the scruff of the neck and put it on a rock-solid mathematical footing. During his own lifetime, the huge significance of his work won little or no recognition. Later, however, his work provided the platform for Isaac Newton to discover the law of universal gravitation. When Newton (perhaps with double meaning) said that if he had seen further, it was by standing on the shoulders of giants, there can be no doubt that Johannes Kepler was one of the giants. Although he greatly admired Galileo’s work, Kepler disagreed with him about the cause of tides on Earth. Galileo believed they were caused by the earth spinning. Kepler, correctly, identified that they were caused by the moon. Kepler wrote, about a ‘magnetic force’ which we would today call the force of gravity. The moon… is a mass, akin to the mass of the earth, attracts the waters by a magnetic force, not because they are liquid, but because they possess earthy substance, and so share in the movements of a heavy body. Kepler made important discoveries in optics. 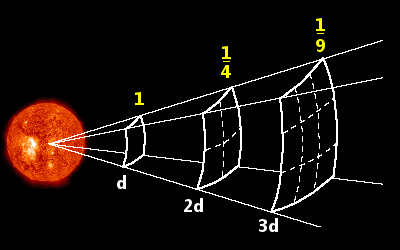 In 1604, Kepler discovered the inverse square law of light intensity. If you double your distance from the sun, the amount of light reaching you is lowered by a factor of four. If you triple your distance from the sun, the amount of light you get is reduced by a factor of nine. The consequence of this law is, for example, that while Jupiter is about five times farther than Earth from the sun, each square meter of Jupiter receives only one-twenty-fifth of the sun’s energy compared with a square meter on Earth. When Newton, guided by Kepler’s Third Law, discovered the law of universal gravitation, he found that gravity also follows an inverse square law. So, if you triple your distance from the sun, the force of gravity you feel is divided by nine. It was Kepler who discovered that the lenses in our eyes invert images. This means images on our retinas are upside down. Kepler correctly concluded that the inverted image is corrected by our brains. In 1610 Kepler was excited by news from Italy, where Galileo had discovered four moons orbiting Jupiter. In 1611 Kepler turned his attention to Galileo’s telescope design, improving it by using two convex lenses. This allowed higher magnifications. Kepler’s design is now the standard design for refracting telescopes. Fermat’s Last Theorem, sometimes called Fermat’s Conjecture, took over 300 years to prove. Kepler left the world a puzzle that resisted all attempts at formal proof for 400 years: the Kepler Conjecture. Kepler’s Conjecture looks at how you can pack a bunch of equally sized spheres into the smallest possible space; he says there are two most efficient ways: cubic close packing and hexagonal close packing. Kepler was right. A formal proof of his conjecture was published in 2015 by Thomas Hales and coworkers. It is impossible to pack spheres more efficiently than the arrangements shown in the image: cubic close packing and hexagonal close packing. Image original by Cdang, then modified. It turns out that Kepler’s ideas about packing are useful in modern chemistry, where atoms in metals are arranged in close packed arrangements: for example copper’s atoms are cubic close packed, while magnesium’s atoms are hexagonal close packed. In 1616 Kepler became aware of John Napier’s invention of logarithms. Using logarithms, any multiplication can be turned into an addition; any division can be turned into a subtraction. For example, adding 3.5627685 to 3.7736402 by hand is much easier than multiplying 3654 times 5938. And in Kepler’s day, everything had to be calculated by hand! Napier’s logarithms allowed mathematicians to greatly simplify their calculations. Kepler was overjoyed when he learned of them. And no wonder: he carried out a huge number of calculations in his work, and logarithms sped everything up enormously. But Kepler went one step further. Mathematicians had not been able to understand how logarithms worked. They just saw that they seemed to give the right answers. Kepler saw that if logarithms actually had no firm mathematical basis, his calculations might be discredited someday. He overcame this hurdle in the way any genius would – he himself proved how logarithms transform multiplications and divisions into additions and subtractions. Kepler’s proof allowed all mathematicians to use logarithms with no misgivings. In Kepler’s time, Central Europe was convulsed with tensions between Catholicism and Protestantism – resulting in the Thirty Years’ War. Symbolic of the paranoia of these times, Kepler’s nature loving, herbalist mother was arrested in Württemberg in 1620, charged with witchcraft. She was held in prison for over a year, and the tortures she faced if she did not confess to witchcraft were described to her in detail. Kepler himself traveled to Württemberg and successfully defended his mother, finally winning her release. Kepler moved around a lot during the last few years of his life. His job as a mathematician disappeared and, in an effort to make ends meet, he ended up casting horoscopes for a military commander – General Wallenstein. Johannes Kepler died after falling ill at the age of 58, on November 15, 1630 in the German city of Regensburg. He was survived by a son and a daughter from his first marriage, to Barbara Müller, who died rather young. He was also survived by his second wife, Susanna Reuttinger, and two sons and a daughter from that marriage. Today Kepler’s grave is lost. The graveyard he was buried in was destroyed during religious battles a few years after he was buried. Images of Kepler and others digitally enhanced and colorized by this website. "Johannes Kepler." Famous Scientists. famousscientists.org. 12 Mar. 2015. Web.